Developed by Walter Ott, its first issue was in one troy ounce form, and was minted from 1979 to 1982. It was such a resounding success on the global gold market that the Canadian Parliament authorized the Maple Leaf’s continual production in 1981. Subsequently, the RCM made available additional weights and values of this pristine coin. On the coin’s obverse, the face of Queen Elizabeth II is shown. On coins minted between 1979 and 1981, the artwork is that of Arnold Machin. The Queen is shown “gracefully aging,” wearing a tiara of jewels rather than a crown. Machin’s portrait was first struck in 1965. Next to her face, the letters D.G. appear, a shortened version of “Dei Gratia,” phrasing meaning “God Granted” which appeared on all Canadian coinage carrying the face of the Queen. In 1990, the Queen’s portrait received another update, showing her in her 64th year. Designed by Dora de Pedery-Hunt, this effigy of the crowned monarch is the first by a Canadian artist, and was used until the Queen’s Golden Jubilee, in 2002. The following year, Canada issued a new effigy of the monarch without her crown, designed by Suzanna Blunt. This portrait remains on the obverse of all Canadian coins to date, including the Maple Leaf. The reverse of the coin carries an image of its namesake, the celebrated maple leaf. Coins minted between 1979 and 1982 are verified to be 0.999 gold; after 1982, the amount was increased to 0.9999. Since November 1982, the Maple Leaf has been available in a number of denominations beyond its original one ounce size – 1⁄25 ounce, 1⁄20 ounce, 1⁄10 ounce, 1⁄4 ounce and 1⁄2 ounce – as well as with other metals, such as silver (see Canadian Silver Maple Leaf), platinum and palladium. Identical in design to the one troy ounce coin, the other denominations of the Maple Leaf vary only by their face value. Though these coins, under the Royal Canadian Mint Act, are non-circulating bullion, they still are considered actual money, as per the Canadian Currency Act. As legal tender, they are worth their face values of $1, $5, $10, $20 and $50. The Royal Canadian Mint is renowned for its technical innovations in the striking of precious metals coins. It is famous for issuing commemorative coins and even holds a patent for bimetallic coin production. One such example is the million dollar Gold Maple Leaf. Yes, the RCM issued a Golden Maple Leaf coin with face value of one million Canadian dollars. Meant to serve as a 2007 promotional piece announcing the arrival of 99.9999% purity gold coins, the Mint found itself fielding offers from buyers. The coin measures 50 cm diameter by 3 cm thick. It has a mass of 100 kg, with a purity of 99.999%. To date, at least 5 orders have been filled. Other odd versions of the coin include a $200 Canadian Maple Leaf coin, designed by Stanley Witten, or a Hologram Maple Leaf Coin in 1 ounce or 1/4 ounce sizes, which was designed by Walter Ott of RCM Engravers. 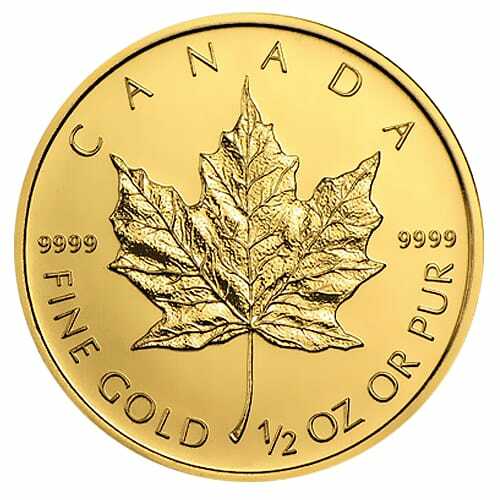 The Canadian Gold Maple Leaf is available to buy for physical possession, or for placement in a Precious Metals IRA. 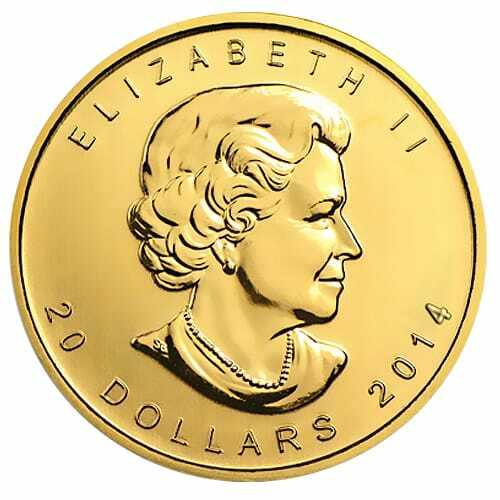 To learn more about Canadian Gold Maple Leaf coins and to get current pricing, please call us at (800)355-2116.